I Violated My Probation for the Second Time, Now What? It happened again. You’ve violated your probation for a second time and jail time is looking very possible in your future. Whether it was a failed drug test, not reporting to your probation officer or being arrested for a new offense, the judge will likely be much less lenient the second time around. So, what should you expect to happen? This is the most lenient thing that could happen and much more likely for a first time probation offender. This is an unlikely outcome, depending on the infraction. Jail time is likely and just being sent for a short time is something your probation violation attorney will have to fight for as it may be best case scenario. This is where hiring the best defense lawyers in the business comes into play. Depending on the crime, fines and costs could be added on to your sentence. You could be ordered to test more frequently for drugs and alcohol. You could be ordered to complete a program, such as drug rehabilitation. You could be ordered to complete many hours of community service work. This consequence can be in addition to incarceration. This is a very realistic consequence after your second probation violation and it may be unavoidable, depending on the violation. Another arrest or serious infraction could likely mean immediate jail time. If you have a special status in the law that keeps the conviction from appearing on a public record (Holmes Youthful Trainee Act [HYTA]; 7411; 769.4a; etc.) you can lose that status. The loss of 7411 status will result in sanctions by the Michigan Secretary of State to your driving privileges, regardless of whether or not the original offense or the probation violation involved any sort of driving infraction. There are other consequences that can result with a probation violation: loss of employment; loss of educational opportunities; loss of tuition; damage to your relationship with family and friends; stress, fear, and anxiety. Hiring an experienced criminal defense lawyer is the first step to trying to overcome this difficult situation. The right lawyer will provide you with the necessary preparation, strategy, and advice to help you get the best possible outcome given your situation. The actual result to a probation violation can never be predicted. The original charge, the Judge assigned, the nature of the probation violations, the number of previous probation violations, the person’s prior record, the probation agent, and the prosecutor all can play roles in how the case is perceived and handled. 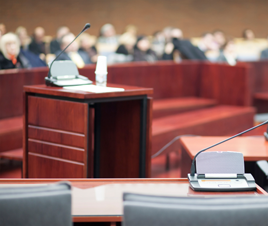 The biggest factor in your case may be the quality of legal representation that you obtain. Violating probation is a very serious offense that will not be taken lightly. If you have struggled to stay in the good graces of the court, make sure you contact the best probation violation and defense attorney at Hilf & Hilf, PLC. We will do what we can to represent you as well as possible while trying to limit your sentencing.